“Triggered!” at Science World at Telus World of Science is an exciting new environmental education exhibit. Based upon the research field-trip to the site and the informative presentation from Jody and Rob, I was able to develop an exhibit which encourages the user to engage and interact. “Triggered!” is located in the Avalanche Exhibit, in the new Natural Disasters presentation area. In the Avalanche Exhibit, visitors can expect to learn about the different types of avalanches, what triggers them, how to avoid being stuck in one, and what the potential warning signs of an avalanche are. “Triggered!” is an interactive simulation where visitors are encouraged to dive-in. The simulation is meant to demonstrate the magnitude of an avalanches power. When visitors approach the exhibit, they assume this is a ball pit. But this is no ordinary ball pit. There is a warning side at the entrance, parents should read this so they are informed and can pre-warn their children if they deem necessary. 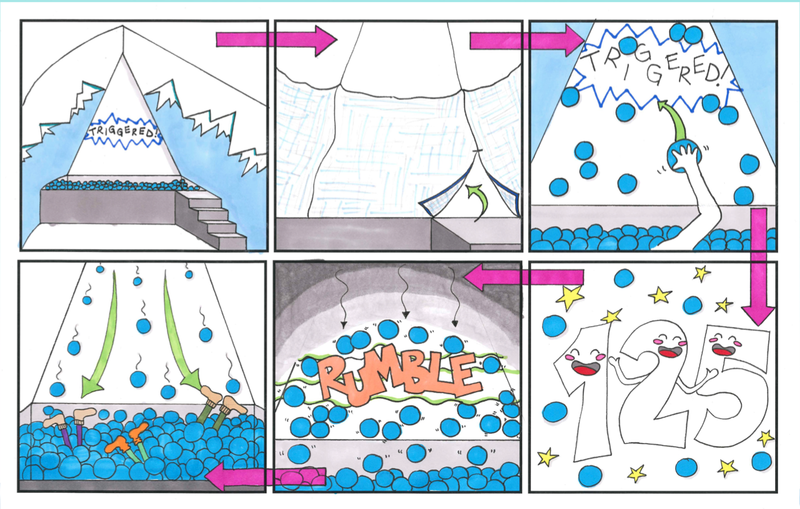 Children aged twelve and under will enter the ball pit via wide-stepped foam wrapped stairs, leaving their shoes outside. The exhibit is enclosed with nylon netting and a magnetic closure door, to ensure the exhibit stays contained (to a degree). The 750 “balls” filling the pit represent snowflakes; they are made from wool felt, foam batting and magnetic sand. They are a neon blue colour to prevent theft, and have a 4” diameter to make them easier for little hands to hold, and to prevent visitors from pocketing them. Twenty-five percent of the 750 balls (187 balls) have RFID tags (radio-frequency identification). The children are instructed, through the info-graphics on the wall, to throw the balls onto the mountain slope (45% grade) in front of them. Large magnetics positioned under the slope attach the balls in place, and prevent them from rolling down. When two-thirds of the balls (125 balls) are attached to the slope, a switch is activated. The lights begin to dim and pulse slightly, a large thundering sound is played through the heavy-bass system and the ball pit begins to rumble, vibrating the users around. This last for 7 seconds and then… BOOM! A large booming sound is played and the magnet under the slope is released and the balls come tumbling down. The balls come flying down, swooping the visitors off of their feet and burying them. This last 10 seconds until the avalanche comes to a stop and the lights are turned back on. This exhibit is relevant to the residents and visitors of the Lower Mainland because many frequent the local North Shore Mountains and Whistler. The realities of avalanches are serious and real, the exhibit strives to educate users of the potential severity of snow.